Photo credit: Downtown Lee's Summit Main Street, Inc. Downtown Lee’s Summit, Missouri, produces “scratch to win” tickets for Small Business Saturday. “We give them to each of the businesses to hand out and have an option on the back of the cards for a 'Second Chance' entry, where we then collect that oh-so important email address,” explains Donnie Rodgers, Executive Director of Downtown Lee's Summit Main Street, Inc. In addition to the 'Scratch to Win' cards, Downtown Lee’s Summit Main Street passed out Shop Small swag provided by American Express and 2,000 personalized shopping bags. “We plan to do more this year. The swag is just such a hit." In Chicago’s north-side neighborhood, the Six Corners Association is also preparing a scratch card promotion. “For every $5 that people spent at local businesses that day (shown by receipt), they will receive a scratch card with more prizes and discounts,” explains Kelli Wefenstette Executive Director of the Six Corners Association. Plans also include a gift-wrapping station and event at a locally-owned bar and restaurant the night of Small Business Saturday. For many, Small Business Saturday is a catalyst for holiday season-long shopping. 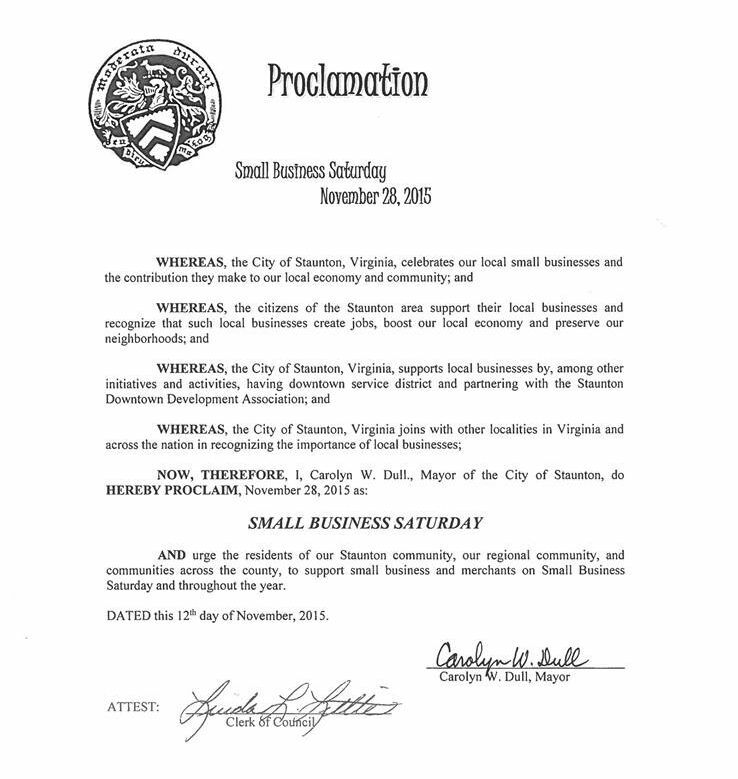 Staunton, located in Virginia’s Shenandoah Valley, has participated in Small Business Saturday since it started in 2010. That year, 25 businesses participated. Now, over 70 will participate in a weekend-long affair! “Locals love it and the Staunton City Council passes a proclamation every year encouraging the community to shop small,” said Julie Markowitz, Executive Director of Staunton Downtown Development Association. Staunton begins their Small Business Saturday promotion in early November with a holiday kick-off event. When coordinating the event, they focus on shopping, spending a lot of time compiling information from businesses and encouraging stores to plan an activity or a sale and to stay open late. On the day, they create a holiday atmosphere with carriage rides and strolling choirs. Social media can play an important role in getting the word out and driving up excitement. 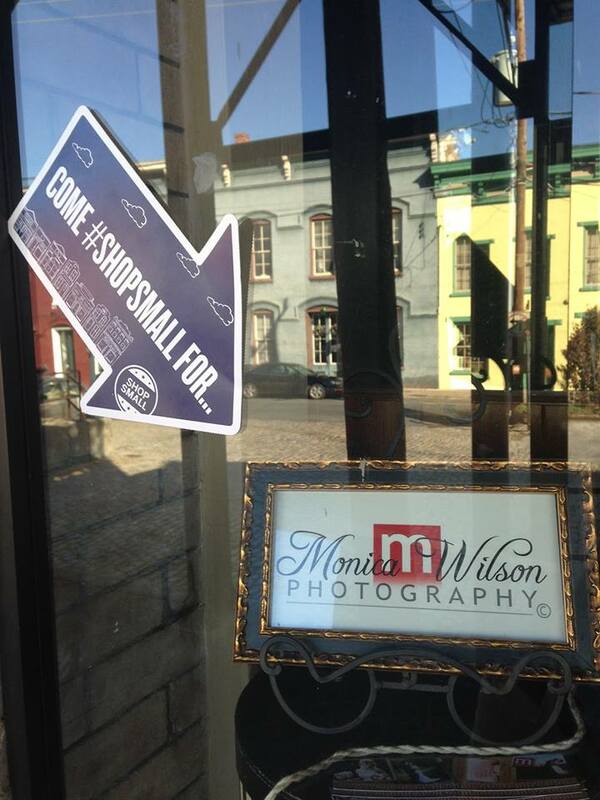 On Facebook, Staunton Downtown Development Association asks customers to take pictures with the swag from American Express and post using the #ShopSmall or #shopstauntonfirst. “We take a lot of pictures, too,” added Markowitz. Staunton also uses more traditional forms of media to add to its success. They claim that national Small Business Saturday television advertising has raised the Shop Small awareness so much that it has made the entire after-Thanksgiving weekend in Downtown busy and successful. 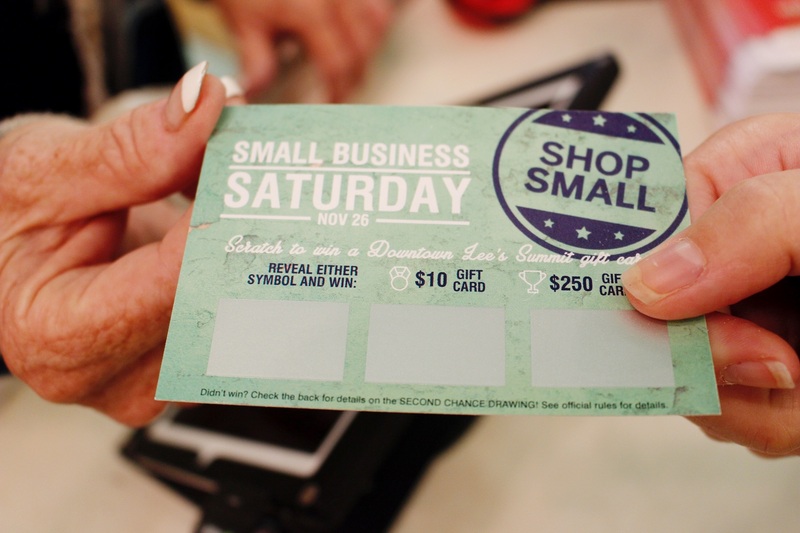 In Morristown, Tennessee, $250 worth of $5 “downtown shopping bucks” are handed out to the first 50 shoppers that come to downtown on Small Business Saturday. The “bucks” are valid until the close of business on December 15 when Crossroads Downtown Partnership, the local Main Street program, hosts a late night downtown event. Passports, Scavenger Hunts and Scratch-offs, oh my! When La Plante participated in "Win the Window,” a passport-like event in downtown Concord, New Hampshire, she received a flyer with over 50 businesses listed and had to get a stamp from 28 to be eligible to win. “28 places is a lot to go to, but I made it,” said La Plante. La Plante cautions that merchants have to be invested in the event and plan their interactions with customers. The secret is to get stamp-seekers to come back again to shop. The treatment they receive, or sales pointed out to them while they are waiting to get their stamps, will get them to return again. Not everyone will know about the promotion, but if anyone buys something from a participating business, stores should suggest they join the contest and visit other stores - and "here's your first stamp." These promotions need to be talked about for people to catch on. Don't require that participants visit too many stores, or all of your stores. All stamps might not be equal. An additional prize could be given to the person who purchased something from the most number of stores. No purchase is necessary but why not reward those who do? Capture customer info on the entry cards. Suggest to merchants that they offer something to visitors to get them to come back when they have time to shop, like $1 toward any purchase, or $5 off a $25 purchase. Want even more Small Business Saturday inspiration? 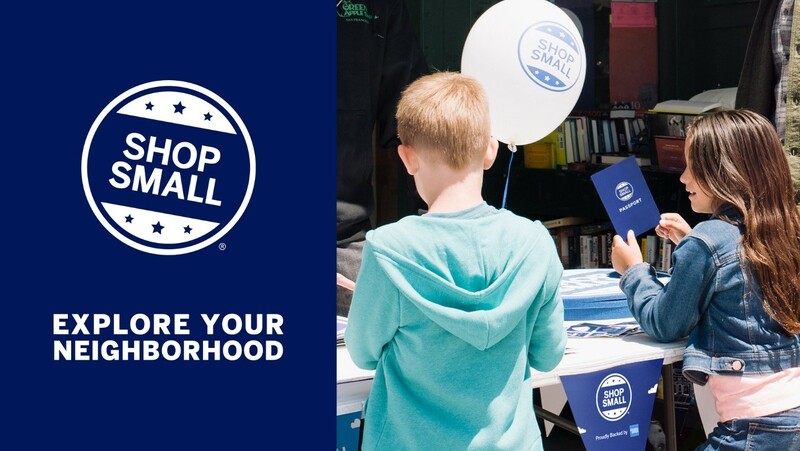 Read past articles on the Main Street blog and be sure to check out the event guides available at ShopSmall.com/rally. You already know how important local businesses are to the success of our communities, so what are you waiting for? 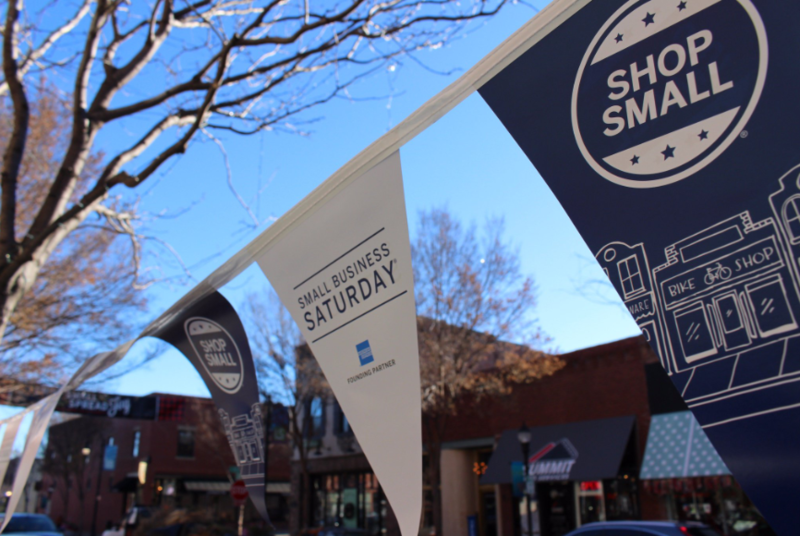 Become a Neighborhood Champion and start planning your Small Business Saturday event today. Let’s help make this year’s Small Business Saturday one of the best! Join us for a free webinar to learn about Small Business Saturday on Thursday, October 25, 2018 at 12:00 p.m. - 1:00 p.m. CDT.